Debating Special Education is a provocative yet timely book examining a range of criticisms made of special education in recent years. Michael Farrell analyses several key debates in special education giving balanced critical responses to inform policy and practice for the future of special education. The book identifies possible limitations to the current special education knowledge base and provision. Michael Farrell examines the value of labelling and classification, and asks if intelligence testing may have detrimental effects; and addresses a number of complex issues such as: how practitioners work within special education; and if, sometimes, professionals may be self-serving whether there is distinctive provision for different types of disabilities and disorders inclusion as mainstreaming offered as an alternative to special education, and the challenges this presents. The author's conclusion is that in responding to these challenges, special education demonstrates its continuing relevance and strength. 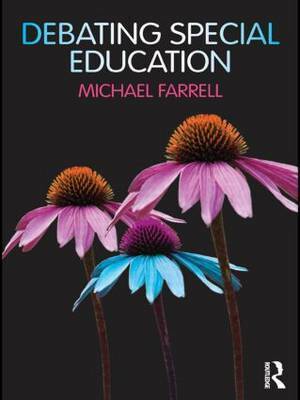 Presenting a range of international, cross-disciplinary perspectives and debates -- which are vital to an understanding of special education today, and written in Farrell's typically accessible style -- this book will be relevant for teachers of special children in ordinary and special schools; those on teacher training courses and anyone whose work relates to special education. Michael Farrell is an independent consultant in special education. He has published extensively in the field; his books include The Special Education Handbook, Celebrating the Special School, Key Issues in Special Education and Educating Special Children along with a number of The Effective Teacher's Guides (all published by Routledge).